Washington (CNN) – Sen. Ted Cruz would not fund Obamacare. He will not fund it, Sam-I-am. He will not like it here or there. He does not like it in a box. He does not like it with a Fox. He does not like it in a house (small H). He does not like it with a mouse. He does not like Obamacare. So he said on the Senate floor for many hours. But it was Tuesday evening that he chose to read Green Eggs and Ham, the Dr. Seuss children's story, as his own children were watching on TV and heading to slumber. But there is a moral to this story, did he miss it, did he mean to, did he know, Sam-I-am? At the end of Green Eggs and Ham, to stop the persistent attempts of Sam-I-am to get him to try a plate of green eggs and ham, the main character takes a bite. All the characters watch for his reaction. And–for those of you who have no experience with Dr. Seuss's classic–he LIKES it, Sam-I-am. This was not lost on Cruz's Democratic colleague Sen. Claire McCaskill of Missouri, who on MSNBC's "Morning Joe" put the long-winded senator in a box, in a house, with a mouse… well, at least over Green Eggs and Ham. "I thought it was interesting that Ted Cruz used Green Eggs and Ham. I went to the University of Missouri. I did not go to Harvard but I'll tell you this, my daughter texted me this morning and said Mom does he not know the point of the story? It's that you can't knock things until you try it. And which is ironic that he used that in the filibuster," McCaskill said. But Cruz did not miss the moral of Green Eggs and Ham. He would not miss it. He could not miss it. He will not like Obamacare. "You know Green Eggs and Ham has some applicability as curious as it might sound to the Obamacare debate. Because three and a half years ago, President Obama and Senate Democrats told the American people just try Obamcare. Just try it. There were an awful lot of us, an awful lot of Republicans who were very, very skeptical of it ," Cruz said. "I'll tell you the difference with Green Eggs and Ham is when Americans tried it, they discovered they did not like green eggs and ham and they did not like Obamacare either. They did not like Obamacare in a box with a fox, in a house or with a mouse." Of course, Dr. Seuss was only a pen-name for Theodor Seuss Geisel, who was an outspoken liberal Democrat. But that's another bedtime story. 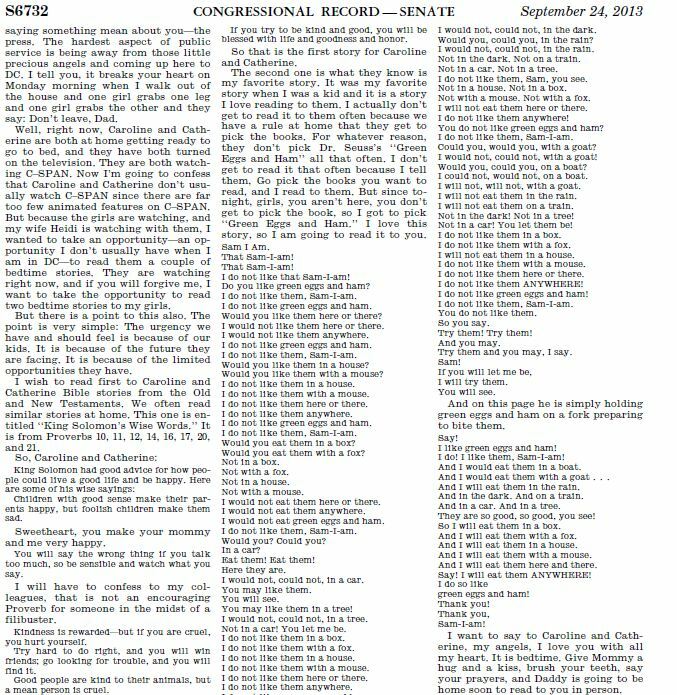 Look: Cruz's reading of Green Eggs and Ham makes it into the Congressional Record. My friend and her husband work in Louisville, Kentucky. They are middle class (lower). They have their medical insurance through Humana, a very big insurer in our area. They received a notice (more like a warning) that their $333.00 monthly family insurance premium with bill raised to $935.00 per month to account for accommodating the new rules brought in with Obamacare. They can't pay it. This is the reality. We can beat up on Republicans and staunchly stick party line to Democrats with this issue, or we can be adults and declare this a disaster for the middle class. Ted Cruz is not a stupid person. He sees it. I thank him at least for trying. I hope you all enjoy a lowered standard of living in the very near future. First my paycheck got smaller last January with the expiration of the tax cuts, and now health premiums will break me. I literally will not have enough to pay everything. I am a single mom with a Master's Degree. I teach. This is reality. I am so sick of the partyline bickering. Let's us our heads. We are AMERICANS first. "But the President and Congress has exempted Cruz and Claire McCaskill from participating in Obamacare"
No they didn't. As required by the ACA for every large employer, the gov't is providing health insurance to its employees. There's no exemption. The federal gov't is, in fact, obeying the ACA. Ted Cruz is wasting our tax dollars with this "Nutso crap"! He is a traitor and not a true American Citizen! Show the birth certificate, fool? Right wing white trash racists think they aren't racist because they embrace this Latino. They still hate him though. Oh the irony of Green Eggs and Ham, turns out he likes them, Sam I am! I'm beginning to wonder if RAFAEL Cruz is a plant by Democrats to finally destroy the republicant party. No one single person has managed to do so much damage. I also wonder, if RAFAEL Cruz, has violated any copywrite laws by reading this book in public without the consent of Dr Suess's estate? Cruz will introduce nothing on healthcare. Republicans don't care about healthcare. They liked it the way it was before - they get more of it, we get less. and then say its nothing like that, sheer genius! What's amazing to me is that all these loons rale against Obamacare every chance they get yet they have no plan of their own to replace it. We've been waiting for years for these clowns to come up with a plan and still they have none yet castigate President Obama for having a plan. If you have nothing better to offer sit down, shut up and let's give the ACA a try and see how it works.